Acknowledgements: Gripboard for having this Mash Monster certification pyramid and all those involved in making it happen. Chez(Gripboard)- who has always been helpful, polite and has a great gripper training video and My wonderful wife and son for their unconditional love and encouragement. 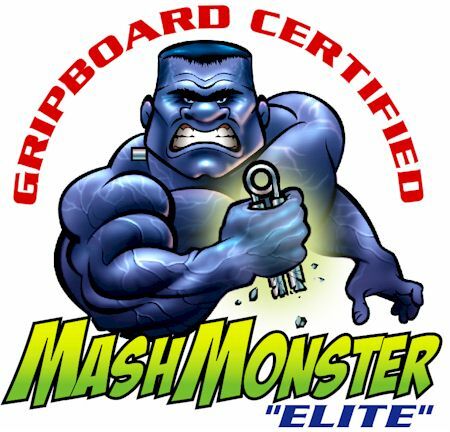 Michael Thomas the 59th man in the world to close the Mash Monster Gripper - Level 2. I have been lifting weights since 13 years old. I stumbled upon a grip youtube video and it looked interesting. Train with purpose, proper recovery and keep a journal. Random/unconventional and much is done by how I feel- I might do thickbar 2-3 days in a row along with grippers and pinch then next week only 1x each on separate days- just depends on how I feel. When I first started I did not train grippers- that went on for about 4-5 months before I figured I better do it. There seems to be a significant variation in the frequency of grip workouts among trainees. Have you experimented with workout frequency and it’s affect on your training? I enjoy working on my grip on a daily basis but I do my best with 4-5 days training a week. IM Axle, Pickaxe, 2 hands key pinch, HEAVY 1 arm DB rows w/o straps and greshamgripper rows(1 arm barbell/axle rows w/o using straps or collars). Buy some Metolius rock rings and sledgehammer- ASAP, Pinch and thick bar 1-2x week, some form of rowing w/o straps 2x week, wrist work and grippers 1x week. 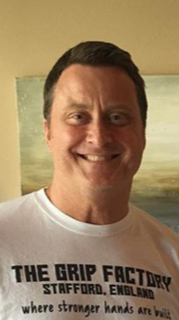 David Horne, Aaron Corcorran, Thomas Larsen, Riccardo Magni, Eric Roussin, Mike Rinderle, Steve Millard, Gil Goodman, Tim Butler, Cesare Ricchezza, Chris Rice, Odd Haugen, Bob Sundin, Jedd Johnson, Jerome Bloom, Marco Buhl, Big Joe Sullivan - all quality and outstanding men to represent Grip. Do you have any parting advice for readers? Keep grip strength and subsequent accolades in perspective- nobody outside of grip really cares if you can close a #3, keypinch World class level,RT 200lbs,etc- they care if you are helpful and considerate of others.